Okay, the pond bank hasn't come up with all the wild stuff it likes to grow as of yet. 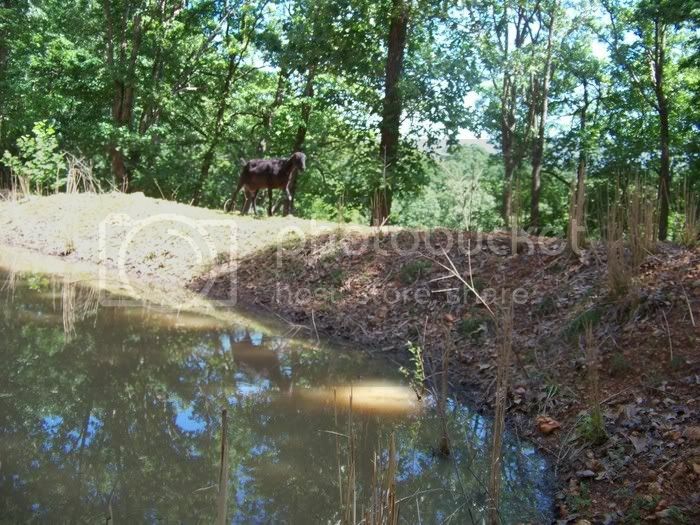 What would look good there, not mind being grazed by the animals, and help prevent erosion? Originally, it was suppose to have an island with 2 trees in the middle of the pond, one tree died, and the the second tree didn't end up on an island, but at the side of a large mound of dirt. It is sort of horseshoe shape, but the one side of the horseshoe doesn't really hold water, it is just low land, with banks! Looks whacky. How can I make it pretty as well as useful? I thought of growing rice in some cages, protected from the animals? I would go with wet soil tolerant native trees and shrubs. I've a whole list I could rattle off for my area, but I don't know what would be the right choice if yours. You would have to consider toxicity to the goats as well. I picture year-round interest, with something flowering in each season, and berries or nuts for native wildlife value. Pleasant fragrance would be a plus too. I'm really curious to see how your rice idea works out. It's done by the LadyBird Johnson Wildflower Center at U. Texas. You put in your state and what kind of plant you are interested in like shrub or tree or herb (meaning perennial) and what light and moisture conditions and it pops up a big long list of native plants for you. starting with scarlet buckeye, indigo bush, beautyberry, new jersey tea, and button bush... all nice choices! Nice place you've got there! Madame, I thing your swale on contours have potential for harvesting some serious fruit. Apples plums maybe apricots cherries anything that you like I would place them there in a tallest to shortest set up. The tallest make shade and the shortest, well, they just make sweet fruit in their comfort zone. On one side place nitrogen fixing trees where the goat is standing and on the other place your fruit trees. See how tall that one tree is in the last picture? You can have rows of trees coming towards you like an orchard but with rows of differant fruits. RBG's link is so so useful. I would love to get some good browse going in the fencerows. I had an old, old book on animals, and it talked about how the gypsies had horses that were wonderful. And alot of it was milk until quite grown, and they fed in fencerows that had lots of herbs, honeysuckles etc. 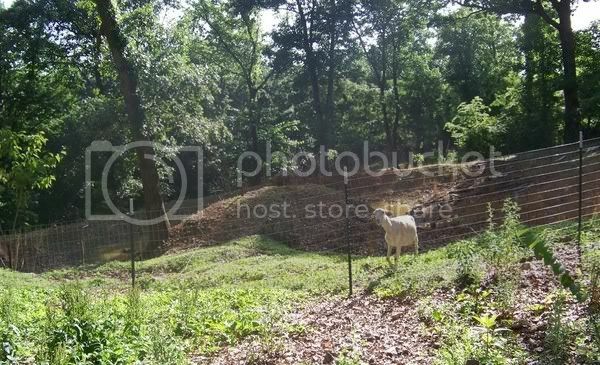 So, I am looking for herbs that are perennials and I can plant in the fencerow, just out of reach, until they grow large, and let the goats "prune" the excess that grows close enough while protecting the base. They do that now with the elderberries, blackberries, raspberries. And on the back side is a mulberry tree, that drops its fruit for the goats enjoyment. I like the fruit tree idea, and I will definitely check the link RBG sent to me, I know that I would need to use good fencing to protect the bark of the trees. The goats can't hurt big trees with strong bark, but young trees, are history when they get to them. I do need to add, my goats are naturally polled, but they won't breed true: that is a recessive gene, and causes bad consequences if you go too close on it, so the new herd buck has horns already, and he is less than a month old. I bought him the day he was born. I think it is plain cruelty to dehorn goats and I refuse to do it. I can simply work around horns! They really aren't that big of a problem, except to trees! Here is the island from another view, and yes a different goat. 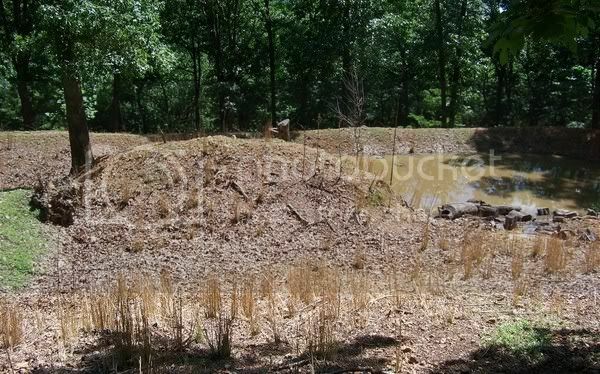 Drained Duck Pond and Rototilled. Now What?